NEW ORLEANS – A man is suing a local elementary school for failing to prevent the door of a bathroom stall from falling off its hinges and injuring him. 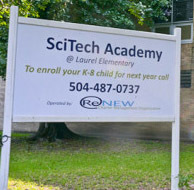 Demone Patterson filed suit against Renew Sci Tech Academy, The Louisiana Board of Elementary Secondary Education, The Recovery School District and Gary Robichaux in the Orleans Parish Civil District Court on October 29. The suit states that on Oct. 29, 2012, the plaintiff was injured when a bathroom stall door fell on his foot. The defendant is accused of maintaining premises in unsafe condition, failing to prevent the door from falling from its hinges, failing to warn, failing to take evasive actions to prevent the incident and being otherwise negligent. The patient seeks an unspecified amount in damages for physical pain and suffering, emotional distress, mental anguish, medical expenses, loss of enjoyment of life as well as other items of damage to be enumerated at the time of the trial. The plaintiff is represented by attorney Sherry Legaux of New Orleans. The case has been assigned to Division I Judge Piper D Griffin.